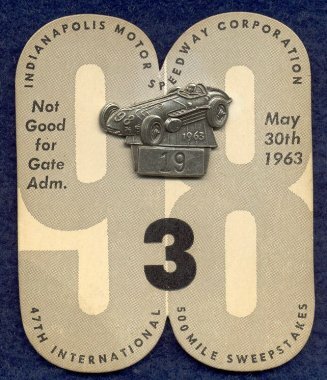 The 1960 badge is small measuring 1 1/16" x 3/4" and depicts a Champion spark plug in front of an aerial view of the Speedway. The proof or salesman sample is numbered "0000" as is the 1969 below. 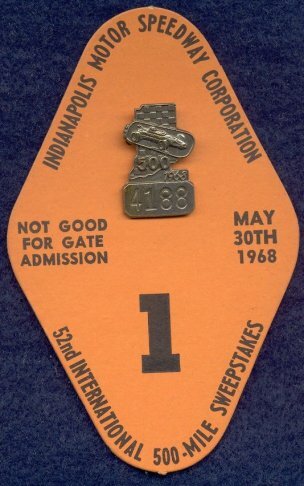 1961 marked the 50th Anniversary of the first “500” won by Ray Harroun so in commemoration of that win, the Speedway issued a "gold" colored badge instead of bronze. The Marmon Wasp that carried Harroun to victory is shown at center with the dates "1911" and "1961" inside checkered flags on each side. The badge measures 1 1/8" x 7/8". There is NO Bastian Brothers name or logo on the back. 1962 depicts the "new" main gate erected in 1956. This gate gave way to another "new" main gate in the mid 90's. Measurements are 7/8" x 1 1/4". The 1963 badge depicts 'Ol Calhoun, the car that officially broke the 150 MPH barrier in 1962 and carried Parnelli Jones to victory in 1963. The badge comes in at 1 1/3" x 7/8". 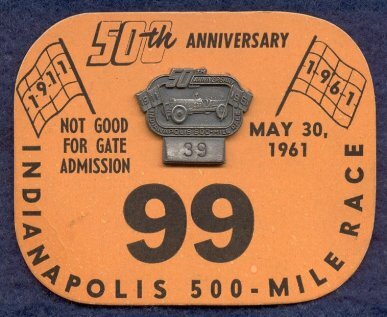 The 1964 badge again uses the checkered state of Indiana with an aerial view of the Speedway superimposed which is very similar to the 1958 badge and is so in size. For 1965, the Speedway chose to use the "Wing and Wheel" design for a third time. Coming in at a little under 1" x a little over 1 1/2", the '65 is one of the larger badges of the 60's. 1966 depicts a Stoddard-Dayton which was the Pace Car for the 1911, '13 and '14 races. The back states that indeed it was the first Pace Car. The size is 1 1/8" x 3/4". The 1961 Cooper-Climax driven by Sir Jack Brabham to 9th place in 1961 is depicted on the 1967 badge. This car was the first modern day rear engine car and started the rear engine revolution at Indy which, by 1967, was the dominate car in the field with all 33 cars being of rear engine design. It measures 1 3/5" x 3/4" The "7" of 1967 is sometimes mistaken for a "1". 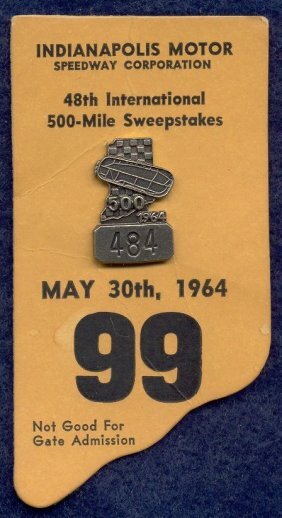 The 1968 badge uses the same design as the 1958 and 1964 badge, and is the same size, except this time a race car is inside the Speedway boundary. 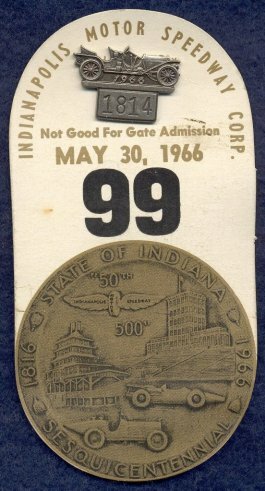 In 1968, the movie "Winning" was filmed at the Speedway and to honor that the Speedway chose to use a movie camera with "Winning" written across the top. 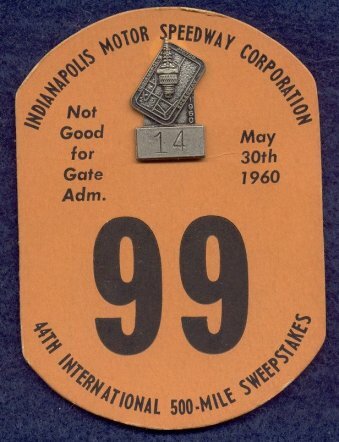 At 1 1/4" x 1 1/4", the 1969 is one of the largest badges of the 1960's. The clasp and pin change in 1969 to a bit lighter design. The proof or salesman sample is #0000. 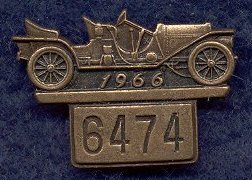 The 1960 through 1969 badges become easier to find with the 1961, 63, 67 and 69 silvers considered the toughest to come by.